The inner tunic was a peplos or chiton. The peplos was a garment worn by women. 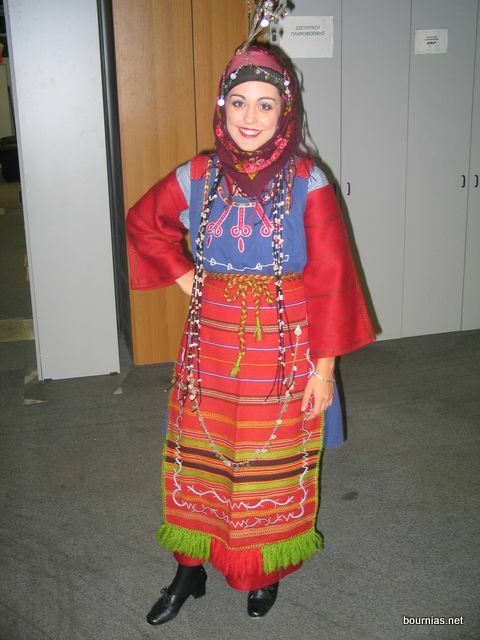 It was usually a heavier woollen garment, more distinctively Greek, with its shoulder clasps. The upper part of the peplos was folded down to the waist to form an apoptygma. The chiton was a simple tunic garment of lighter linen, worn by both genders and all ages. Men's chitons hung to the knees, whereas women's chitons fell to their ankles. Often the chiton is shown as pleated. Either garment could be pulled up under the belt to blouse the fabric: kolpos. The chlamys was made from a seamless rectangle of woolen material worn by men as a cloak. It was about the size of a blanket, usually bordered. 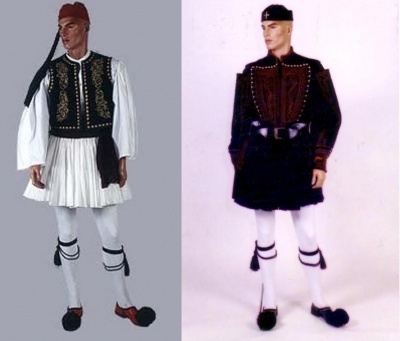 The chlamys was typical Greek military attire from the 5th to the 3rd century BC. As worn by soldiers, it could be wrapped around the arm and used as a light shield in combat. 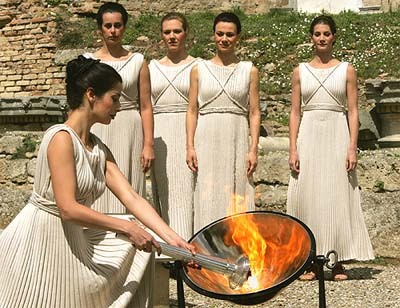 Clothes in ancient Greece were manufactured from natural sources: wool, flax and leather. Wool was the most commonly used material because of the abundance of sheep, which was a main staple of the Greek economy. Flax was used to make fine linen, but only the wealthy and certain priests and priestesses in the temples used this. Leather was used to make armor for the soldiers and shoes. Colors for the average Greek in ancient Greece reflected status. 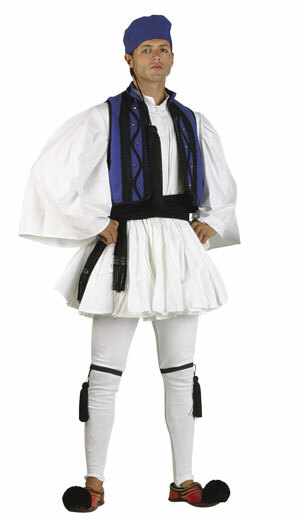 The majority of the Greek population at this time wore rough homespun wool garments, which were often brown or beige in color. However, wall frescoes, such as the wall paintings from the archaeological site Akrotiri, Thera, that are now at the National Archaeological Museum in Greece, have revealed that the ancient Greeks also loved colors. Since production of dyed materials was time-consuming and cost-prohibitive, it is believed that only the wealthy and those affiliated with the religious institutions of the time could afford this enhancement. Wall frescoes show that the Greeks had the ability to produce colors such as pink, yellow, blue and brown. In addition, fabrics were bleached white reflecting purity or great wealth. An ancient Greek wearing white indicated that the person had enough slaves that he did not have to dirty himself with labor. The coarseness of the fabric also indicated status. Fine linen was manufactured using a process that called for the gathering of flax, removing all the seeds and then soaking the plant until the stalks could be beaten in order to get various degrees of fiber. This fiber was sorted out and only the finest was used to create linen.